Now the Government of the Punjab is going to announced Latest Jobs in Pakistan Primary and Secondary Healthcare Department Jobs 2018 of Project Management Unit (PMU) 04 vacancies of Project Manager Operations (Monthly Salary Package Rs. 150,000), Research Associate (Monthly Pay Rs. 60,000) and Computer Operator (Monthly Salary Rs. 30,000) for Lahore city and the whole Punjab. 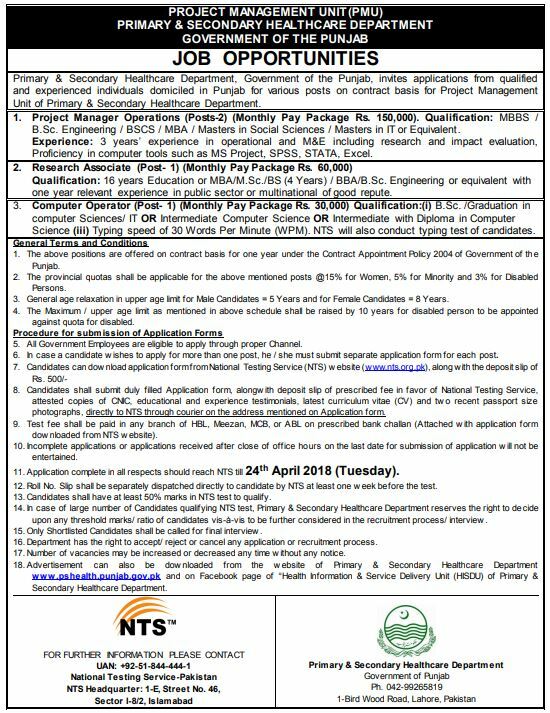 All of us candidates can apply for these posts online register through the National Testing Service of Pakistan and avail the great career change opportunity NTS Jobs 2018 Primary & Secondary Healthcare appointments are coming on 02/04/2018 on today everyone can send their qualification documents posts under the address is submitted and the last date of applying is 24.04.2018 after this date not eligible for that’s jobs Project management unit. Social Welfare, Special Education & Women Empowerment 91 Jobs, 02 Jan-18 Mashriq.